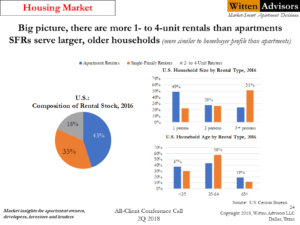 Excerpt from the 2Q18 Witten Advisory: The charts on the right illustrate how different the customers are for single-family rentals and apartments. 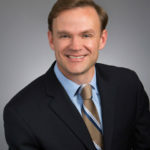 Renters who choose multifamily are typically younger and have small households (probably living alone), while single-family renter households are most likely to have at least three persons and tend to be middle-aged. In this light, the profile of single-family renter households is more similar to homebuyers than to apartment renters. Further, the chart on the left shows that there are more 1- to 4-unit rentals in the U.S. than rental apartments.